And after we had supper, sometimes it was very nice out, so she let us play for a while, and then around seven we all had to come in, my sisters and I…And there was a certain day we’d do sewing by hand, do certain kinds of stitches…That’s when we learned how to do things as a woman’s supposed to do. Women created beautiful small bags from the intestines of sea lions and the gullets of seals. 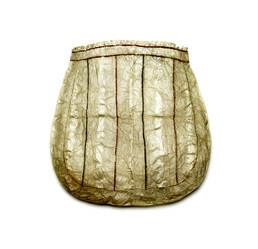 David Samwell, who visited Unalaska Island in 1778 with Captain James Cook, noticed small bags that “they ornament very pretty with their needles.” Elders said that this bag is made from sea lion intestine stitched together with sinew thread, and was probably used to hold sewing materials. The decorative stitching was done with embroidery thread. Older bags were decorated with caribou or mountain goat hair, seal fur, bird feathers, and strips of black or colored esophagus. Mary Bourdukofsky: It’s a bag. They could have used it to keep their sewing things. I’m surprised it doesn’t have a string. Maria Turnpaugh: It may have it at one time. Mary Bourdukofsky: Yes. We used to have a little string [drawstring] on them. I remember my mom had similar one. When they’re new you could just gather them up [by drawstring at top], but right now it’s brittle. Mary Bourdukofsky: It’s made out of gut. Maria Turnpaugh: It looks like intestines, sea lion. Aron Crowell: How do you tell it’s sea lion? Mary Bourdukofsky: You can tell by these white strips here. If it’s esophagus, it doesn’t have that. You split the esophagus with scissors—it’s about this big [diameter approximately one inch]. Then you stretch it, and it becomes about six inches wide. Maria Turnpaugh: And esophagus is heavier than this. Aron Crowell: Would you ever use seal intestine for something like this? Mary Bourdukofsky: Seal intestines are just thick as my little pinkie here, too small for this. Maria Turnpaugh: This gut, they clean it inside and out, all the blood veins and everything. Then they blow it up, tie the ends off and dry them like that. Mary Bourdukofsky: You hang them like on a clothesline, it’s just like a balloon. You make sure you don’t hang it out when it’s damp and misty, then it wouldn’t dry. You make sure it’s out when it’s kind of windy and dry. And then they split it, just like we split the esophagus of the seal. Maria Turnpaugh: These are all separate strips sewn together. Look how neatly it’s stitched. It’s such fine stitching. That seam, it’s what you call a French seam nowadays. Mary Bourdukofsky: A double seam is like a French seam. Makes it airtight. It could have been a water container too. Aron Crowell: And those colored stripes? Maria Turnpaugh: That’s thread. Each color here, that’s the seams where they’re sewn together. It’s probably cotton embroidery. Mary Bourdukofsky: They used black and red. That’s material too, very, very thin material inside the seam. When they fold it the second time, they put this little piece of cloth in there and they stitch over it. I saw my mom [do that]. They did that for decoration. And some of them put feather. Aron Crowell: Is that sewn with sinew? Aron Crowell: What sort of sinew would people use? Mary Bourdukofsky: I remember we had reindeer on the Island [St. Paul], I don’t know about Unalaska. They used to save sinew of the reindeer. They scraped the sinew, dried it up, washed it up, dried it up, and then they split it. It’s really, really strong, just like thread, like dental floss. Aron Crowell: Are people still making them? Maria Turnpaugh: Yes, they wouldn’t be used. I don’t think there’s many people that can do that. Vlass Shabolin: They sell it now as souvenirs. Maria Turnpaugh: Nothing that large though. Vlass Shabolin: No, just the little ones. The kids are into it now. They’re in school, and they collect the esophagus from Northern Fur Seal. Edna Kaffman is the Aleut teacher that’s teaching them how to make a basket or little handbags or whatever like that. Mary Bourdukofsky: Yes. We had a similar gut-wall pocket. Maria Turnpaugh: They used to have these embroidered wall-pockets too. My mother had things like that, but when we came back [after evacuation during World War II], they were gone. Mary Bourdukofsky: Same with us. 1. The word missuuka [bag] comes from the Russian word meshók [bag, sack]. Up until the mid-20th century, Unangax^ women made strong, waterproof bags from the intestines of sea lions and the throats (esophagus) of seals. David Samwell, who visited Unalaska Island in 1778 with Captain James Cook, noticed small bags which, he wrote, “they [Unangax^ women] ornament very pretty with their needles.”(1) Mary Bourdukofsky and Maria Turnpaugh said that this 1880s Atka Island bag is made from sea lion intestine and sewn together with sinew thread. The decorative stitching is done with embroidery thread. Older bags were decorated with caribou or mountain goat hair, seal fur, bird feathers, and strips of black or brightly colored esophagus. (2) Before Russian fur merchants brought iron needles in the 18th century, Unangax^ women sewed with bird or fish bone needles that had notches instead of eyes to hold the thread. (3) Intestine bags had many uses and often held small tools or sewing materials. Bags filled with pieces of fur, feathers, and other sewing supplies were among the household goods that were placed in burial caves at Kagamil Island.